Join us for the very first Hug It Forward Music Festival! We’ve got so many bands that want to play for our cause that we’re making our next concert into a One-Day Music Festival!! …and it happens to be on Cinco de Mayo! So we’ll be celebrating in style. Make sure to arrive early because the one and only “Rawbert” Beard will be hosting the Parking Lot Party starting at 12:30pm. The legend Jorden Smith will be our Welcome Band jamming in the lobby and then Jacob Christopher will be our Kick-Off Band. We can expect some acoustic tunes from this America Country Singer/Songwriter. We’re working on a few surprises for the next set. Split Window from Alma, Colorado will be making their debut with us as the headliner of the first half! Back by popular demand: Monument Music students will have an outrageous set! 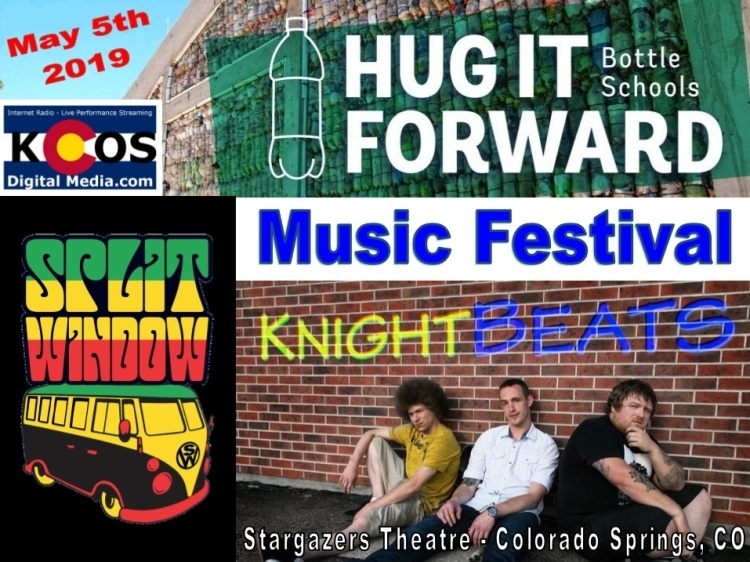 Followed by our headlining band, Colorado’s premier reggae/rock band: The KnightBeats!!! The show doesn’t stop there though! We’ve got another first timer for us – rockin’ jam band: The Eternal Temples will be our After Hours Band for those that want to stick around and party on. Don’t miss this historic event! Tickets are only $10. Kids 10 and under are FREE! All the money we raise will go to the US-based non-profit Hug It Forward to build more Bottle Schools in Guatemala. We’ve got plenty of surprises for you, we’ll share some stories/pics from our trips down to Guatemala, we’ll have some activities for the kids, and we’ll feature some of Colorado’s finest musicians/bands while we raise money and awareness to build more schools! !